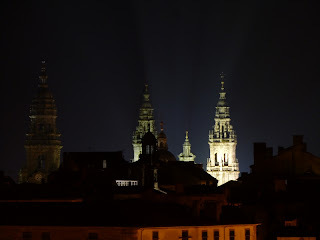 Santiago de Compostela is one of the most important Christian holy sites in Europe, the burial place, according to legend, of St James the Apostle, and the destination for countless hardy pilgrims who purify their souls by walking great distances to get here. And they really want you to know they've done it! Apart from the ubiquitous scallop shells – the symbol of St James – dangling from backpacks, about half tourists in the town are wearing tee-shirts emblazoned with "I made it!" or some such. But there is more to Santiago than pilgrims. The old city is a wonder with the cathedral as its centrepiece. Surrounding it are a maze of winding cobbled streets of stone buildings. Those that aren't churches or convents are a nice mix of shops, hotels, restaurants, bars. The atmosphere is lively with many outdoor music acts going on into the mild, late-summer night. I chose a hotel just outside the old town centre. It's another cheap-and-cheerful joint with pleasant staff who were happy to point out some restaurants that are good value for money. They also gave me a free ticket to the Cidade da Cultura, which is an impressive new construction up on a hill, just outside the town. I plan to visit that tomorrow.